“Surgeon On Call 24-7” from Christian Faith Publishing author Harold P Adolph, MD FACS details the career of a medical missionary who faced the challenges of providing care to desperate patients in remote hospitals. Harold P Adolph, MD FACS shares the countless miracles he has seen since his career began in 1966 in order to thrill and inspire. “Surgeon On Call 24-7”: a collection of stories from the long career of a medical missionary. 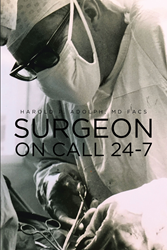 “Surgeon On Call 24-7” is the creation of published author, Harold P Adolph, MD FACS. Harold is a surgeon and distinguished professor at Toledo University of Toledo, Ohio. Dr. Adolph, in association with the Pan-African Academy of Christian Surgeons, is the President Emeritus of St. Luke’s Health Care Foundation, which operates a surgical training hospital in South Central Ethiopia that prepares surgeons to work in hospitals throughout Africa. He has had his board certification in general surgery since 1965. He was accepted as a fellow of the American College of Surgeons in 1972 and was accepted as a fellow of the International College of Surgeons in 1982. Dr. Adolph then joined the American Association of Abdominal Surgeons in 1984. He was also a Christian Medical-Dental Association trustee from 1976 to 1979, the CMDA secretary/treasurer from 1978 to 1979, and the Chicago CMDA President from 1980 to 1987. Dr. Adolph is a graduate of the Perelman School of Medicine of the University of Pennsylvania. He has also had surgical training at Gorgas Hospital in the Panama Canal Zone and the Cannon Junior Memorial Hospital in North Carolina. He was awarded Missionary of the Year by the Christian Medical-Dental Association in 1997, the Governor’s Award for distinguished service to Central DuPage Hospital and developing countries in 2003, and Servant of Christ Award in 2004. He was also the Stewart Lecturer at the twenty-fifth CMDA-CME Symposium in Kenya. Dr. Adolph received the Alumni of the Year Distinguished Service to Society Award from Wheaton College in 2004. Dr. Harold P. Adolph was also inducted into the Medical Mission Hall of Fame and honored with the title of Distinguished Global Professor of Toledo University of Toledo, Ohio. He is a member of the board of Distinguished Members of the American College of General Surgeons. He is also a Lifetime Distinguished Fellow of the American College of General Surgery FACGS. Published by Christian Faith Publishing, Harold P Adolph’s new book shares thrilling and inspiring stories of surgical challenges from around the world. Born to medical missionaries in China, Harold Paul Adolph felt he was being called to medical service even at an early time in life. After his life was repeatedly snatched from the jaws of death, Dr. Adolph finally recognized God had placed him on assignment. He felt led by God to work as a surgeon in places with few surgeons and to train surgeons to carry on this ministry for the sake of the gospel. Since 1966, Dr. Adolph and his wife, Bonnie Jo, have served in the US, Liberia, Niger Republic, and Ethiopia. They have also set up a two-hundred-bed surgical training center in South Central Ethiopia with a dedicated staff of expatriate and Ethiopian specialists. In “Surgeon On Call 24-7,” Dr. Adolph discusses the living circumstances of the patients and key elements of surgery, including the providence and provision God afforded him over the many years of doing what many would have considered an impossible “on call” schedule. View a synopsis of “Surgeon On Call 24-7” on YouTube. Consumers can purchase “Surgeon On Call 24-7” at traditional brick & mortar bookstores, or online at Amazon.com, Apple iTunes store, or Barnes and Noble. For additional information or inquiries about “Surgeon On Call 24-7,” contact the Christian Faith Publishing media department at 866-554-0919.